Everybody can take advantage of turboSMTP’s email delivery tracking system. In a few seconds you will be able to keep track of any message you sent, and get, in real time, information about who has read your emails and when. You only have to register to our website and you’ll have immediate full access to all our dashboard tools, like the tracking one. This way you will get a clear, graphic representation of your email delivery rate and the delivery status for any single recipient. 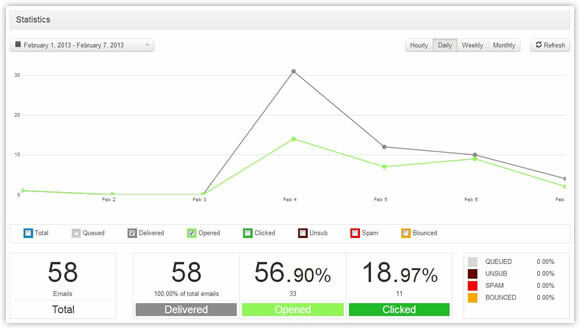 In short, the tool gives you a total control of your sent emails, enabling you to know any action your users made. For instance, you will be able to track down the date and time of any opening and other advanced data like the average first opens per mail, the average clicking delay and a chart with your recipients’ most used browsers. Unfortunately, the pretty obvious “number of emails sent – number of bounces = number of emails delivered” is not correct, because some messages can be simply filtered out by antispam systems or incoming servers, without you knowing it at all. 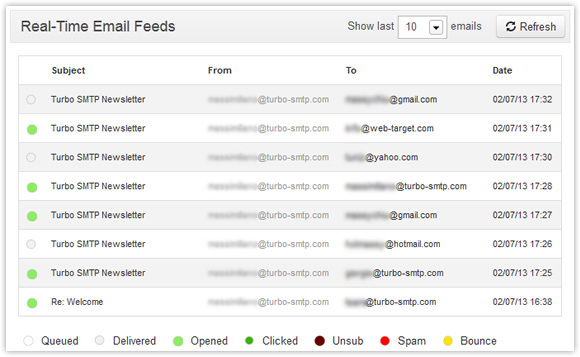 And that’s exactly why turboSMTP provides a reliable email tracking tool. Technically, it works with a small piece of code automatically inserted into the HTML source of the email, turboSMTP allows you to check just after any mailout the status of your actual delivery. Moreover, with our new dashboard you will be able to verify in real-time other important actions – for instance, if a recipient has read your email. You can get immediately 6000 free relays/month, lifetime, and then upgrade in case you need to send more emails.